CES Cru – '13' EP Available For Pre-Order! Strange Music is preparing to unleash CES Cru upon the world! If you were lucky enough to catch Ubiquitous and Godemis, collectively known as CES Cru, on select Hostile Takeover 2012 Tour dates, then you already know what they’re capable of! 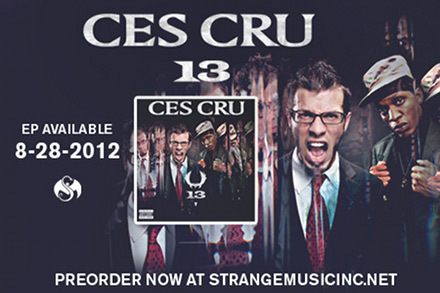 If you haven’t yet experienced CES Cru, then this is your chance – their new EP, 13, will be available August 28! Here’s your chance to preorder your copy of CES Cru’s first Strange Music release. Featuring Tech N9ne, Krizz Kaliko and Info Gates, you’ll start to believe that 13 is your lucky number! Pre-order your copy now at strangemusicinc.net – you’ll get a signed copy of the 13 EP and a Strange Music Snake and Bat decal!